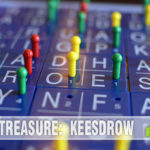 Although we’ve been playing all types of board games for the past several years, it’s not uncommon for me to pick up new terminology. 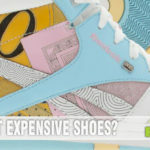 As with any hobby, interest or career, more details emerge for people who are interested in learning. That’s what continues to happen as I delve deeper in the gaming industry. I continue to grasp more about the process from concept and prototype to pitching publishers and seeing the game on retail shelves… and everything in between. But part of that is because the hobby game industry is constantly evolving and changing. “Roll and move” and “Strategy” games have been around for longer than I’ve been on this earth. However, until a few years ago, you wouldn’t likely have heard people refer to “Legacy” games. New game mechanics comes about when you have incredibly talented game designers looking to create something that isn’t simply a copy-cat of what is already available. Today I’m going to share my story of learning about “Engine-Building” games. A couple years back during Gen Con, a publisher was explaining a new game to me. As he begins to share details about the game, he says, “You’re building an engine.” I remember a brief moment of haze as I surveyed the outer space theme for anything relating to engines. I kind of shrugged to myself and thought, “I don’t see engines, but maybe he isn’t there yet.” He continued to explain the game and I quickly had the revelation: It’s a metaphor for the domino effects you hope to create. You aren’t actually thematically building engines. In an engine builder game, you select cards, dice or actions that can kick into gear and cause a chain reaction that positively impacts or will trigger other things on your turn. Think of it as a programming game consisting of if/then statements. Since that time, I’ve played many engine-building games and am trying to master the intricacies of what it takes to succeed. 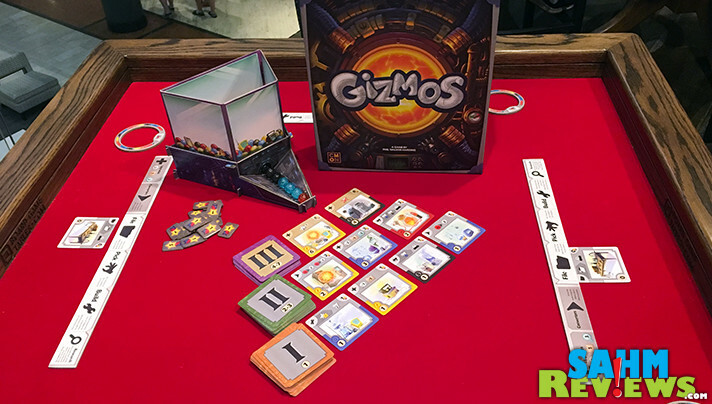 Gizmos from CMON is debuting for sale at Gen Con and is the latest in our collection. 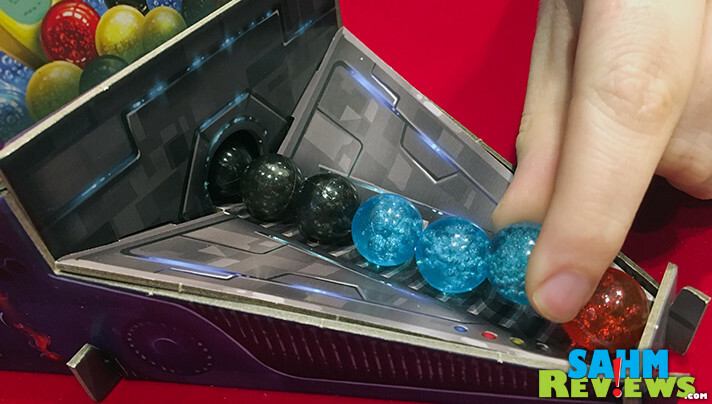 While many engine-building games are typically deck-builders, this one has much more to it, including marbles! As the Great Science Fair approaches, you will be competing against other talented inventors all who are attempting to build award-winning Gizmos. To achieve your goal, you’ll need to coordinate the right components, gather the proper energies and create reactions that trigger other parts of your contraption. 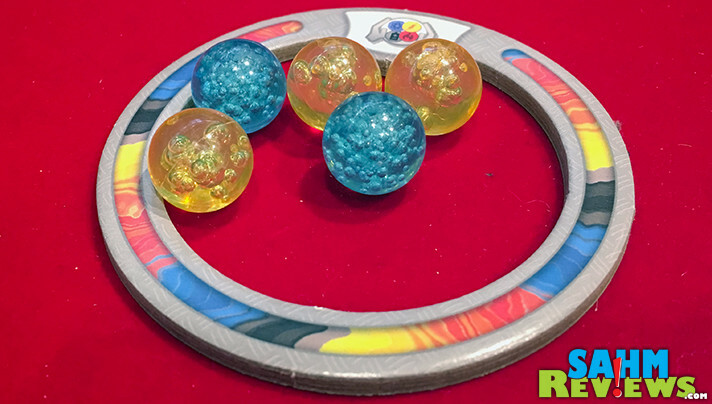 To set up Gizmos, you’ll assemble the Energy Dispenser and fill it with the 52 Energy Spheres. 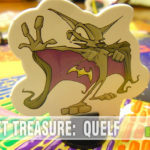 Separate and shuffle the three levels of Gizmo Cards then randomly remove 20 of the Level III cards and return them to the game box. This ensures each game is different! In the center of the play area, place the three decks of Level Cards then reveal a row next to each. Throughout the game, the Display Area will have 4 Level I cards revealed, 3 Level II cards revealed and 2 Level III. Randomly select a Player Dashboard, Starting Gizmo Card and Energy Storage Sphere and place it immediately in front of you to form your work area. Everyone starts with the same basic, limited abilities until you upgrade and improve your Dashboard. The Dashboard consists of six sections that make more sense shortly. The Upgrade area illustrates how many Energy Spheres you are capable of storing, the number of Gizmo Cards you can Archive (hold for a future turn) and how much Research you can do. The Converter indicates ways you are able to manipulate different types of energy. File actions trigger when you select a card from the Display Area and place it in your Archive. Pick and Build sections trigger based on the types of Gizmo Cards you place there. And the final section is Research which is informational only. You don’t store any cards there. On your turn, you’ll be working to add pieces to your experiment by selecting from the items in the Display Area or by taking the Research action to draw off the top of any stack. You may 1) File a card in your Archive, 2) Pick an Energy sphere from the Energy Row and add it to your Energy Storage Ring, 3) Build a faceup Gizmo from the Display Area or one you placed in your Archive on a prior turn or 4) Research. Before I go any further, it’s important to discuss the primary component in this game: energy. There are four different colors of marbles, each representing a different type of energy. Red is heat, yellow is electric, blue is atomic and black is battery. These are all stored in the Energy Dispenser and you’ll have two ways to attain those spheres. You can “pick” which means you’ll grab one from the row that has been dispensed. Sometimes you’ll be able to blindly draw Energy directly from the Dispenser. Any energy you grab is placed in your Energy Storage Ring with a max based on the number indicated in the Upgrade Area of your Dashboard. These spheres are the currency for the game so you’ll need to plan accordingly to be able to purchase the various components that will go into your science experiment. In order to add it to your Dashboard, you need to be able to pay the required energy fee as referenced in the bottom left of each card. Level I cards have a cost of one sphere, Level II cards require 2-3 spheres and Level III cards range in cost from 4-7. If you can’t afford to purchase it right away, you can reserve it in your Archive then build it on a future turn. The top left corner of these cards show their different types which correspond with the different sections of your Dashboard. Upgrades increase the capacity of your Energy Storage Ring allowing you to hold more spheres, increase the number of Gizmo Cards you can reserve in your Archive or increase the number you can Research. Converters turn one type of energy into another. 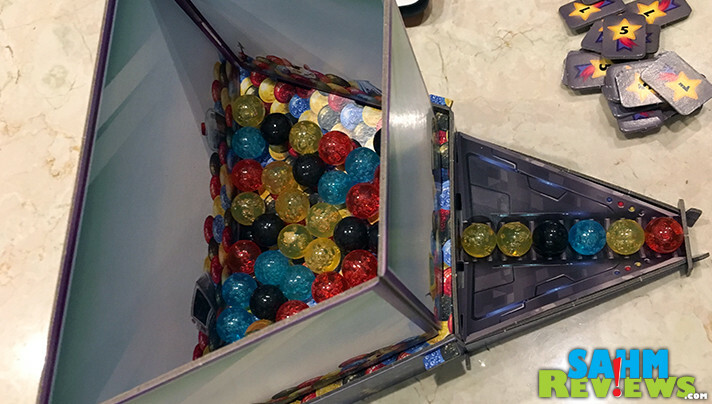 Want to purchase a yellow sphere but they aren’t coming out of the dispenser? Add a Converter to your experiment that changes red into yellow! File cards trigger whenever you add something to your Archive. Pick cards allow you to perform an action whenever you pick an energy sphere from the row. Build goes into effect whenever you add additional parts to your experiment. The key to a successful experiment is how well you’re able to get your engine up and running and causing chain reactions. In other words, focus on building Gizmo Cards that impact each other. As an example, if you add multiple Gizmo Cards to your dashboard that have the Pick (hand picking up a marble) symbol on them, then you’ll trigger other actions whenever you Pick a matching energy source that has been dispensed into the row. Let’s say that whenever you grab a Yellow sphere, it triggers a card that allows you to randomly grab another sphere blindly from the Dispenser. This is a great way to continually attain Energy for future purchases. Maybe you decide to add Gizmos to your dashboard that convert energy types. This gives you more flexibility when you’re trying to build a particular type of Gizmo. 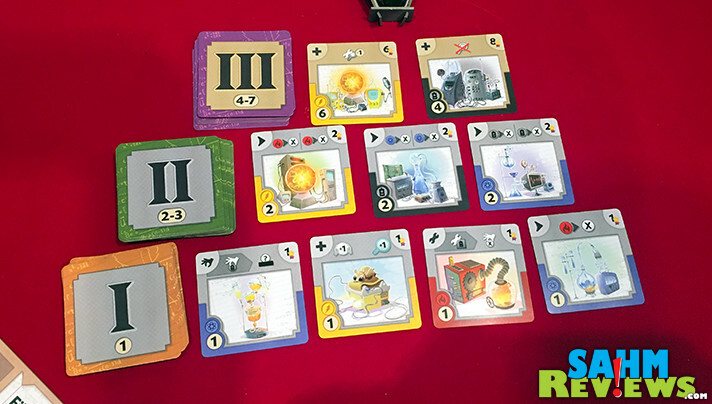 The game ends when one player builds their 4th Level III Gizmo or their 16th Gizmo of any type. Once that happens, play continues back to the first player to ensure everyone has received an equal number of turns. You’ll then calculate the number of Victory Points displayed on the upper right corner of each Gizmo card in addition to any Victory Point tokens you’ve received as a result of chain reactions. The player with the most gets to claim the title for winning the science fair. Gizmos game uses a lot of iconography which could be confusing for young children, but with explanations it is certainly something that younger kids can play. It’s also an excellent resource for anyone learning the concepts of programming and if/then statements. 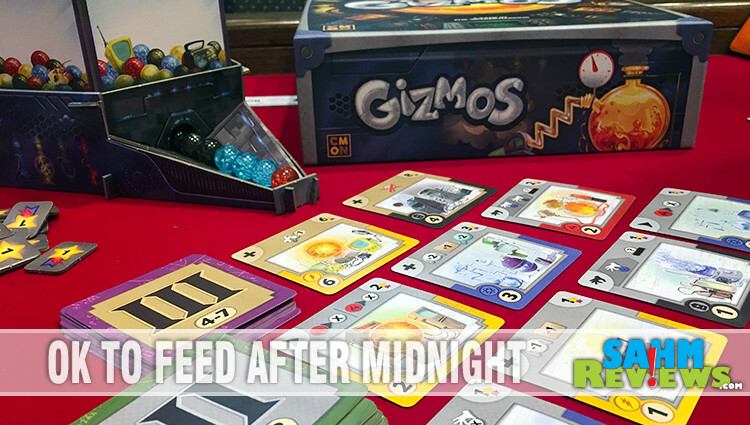 Debuting at Gen Con, you can pre-order Gizmos on Amazon for less than $35. In addition to Gizmos, Way of the Panda and Dragon Castle, you can learn more about what other games CMON has coming out by following them on Twitter and Facebook. And in case you’re curious, the irony wasn’t lost on me. I did notice I tried to explain the engine-building mechanic using a science-fair themed game. Hopefully it didn’t make it more confusing! How did you originally learn about If/Then statements? Well I have to admit, I am confused!! I read this article three times and this engine thing threw me off track!! I think this is about different levels of energy/electricity. I never liked science in school and I haven’t changed my interest at all. 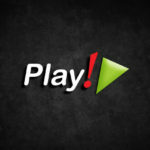 In my opinion, the developers of these games are geniuses! And I think geniuses play these games! It’s really not as difficult as you might think! 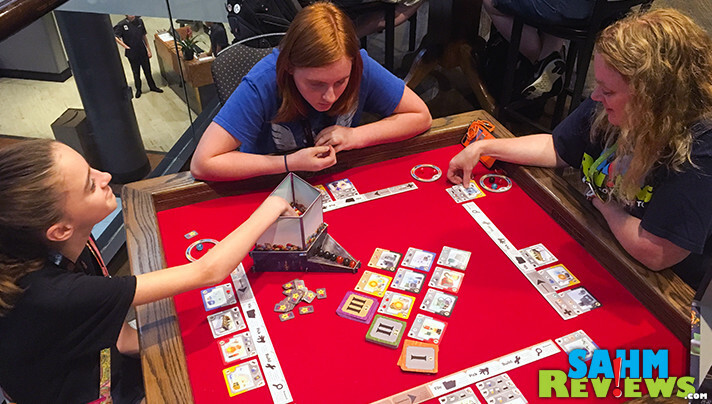 “Engine-building” is a term used to describe a specific board game mechanic (much like “roll-and-move” describes how you play Monopoly). In a nutshell, when you engine build, you’re making your previously-played cards more effective or powerful by playing new cards that pair up well with them. Think of it as wine-and-cheese! Paired together correctly and they both taste better! I’d love to give this game a try! On my “to try” but not my “to buy” list.